It seems many NETCF developers are being bitten on Windows Vista after installing the WM 5.0 SDK for Visual Studio. The symptom is that although the SDK installation appears to go fine, the WM 5.0 project templates do not appear in VS2005. The problem has to do with User Account Control (btw, I'll have a lot more to say about UAC in a future blog post). The way to work around it (on Vista Beta 2 at least) is to disable UAC and then install the WM 5.0 SDK thus getting the project templates to appear. 2. Navigate to "User Accounts and Family Safety -> User Accounts"
3. Click on "Change Security Settings"
Some people are asking about NETCF on Symbian. This makes me smile. You see, every now and then, someone will bring out a Nokia phone and show me some end user feature and ask me how to achieve the same on a Windows Mobile device following it with a rant about how Symbian devices are dominant in the market compared to WM devices. My response is always the same. Yes, at the moment, Symbian is the dominant mobile OS when it comes to number of end user devices out there (not so sure in the enterprise/corporate world). However, from a developer perspective, that is completely irrelevant! Ask not how many devices are out there, ask how many of them are running an app that did not ship with the device. In other words, ask what percentage of Symbian devices compared to WM devices are running a 3rd party application that the user installed themselves. Windows Mobile *is* the dominant OS when you ask the right question and it is kind of expectant really: Every windows developer is a potential WM developer. The platform itself is built with running 3rd party apps in mind. So going back to the original question, it shouldn't surprise us that it is being posed. An unfortunate developer has been asked by a decision maker to target a Symbian device and naturally the developer wants to use a modern, RAD and powerful platform. The best development tool for all your needs is of course Visual Studio. To that end, there is an add-in for Visual Studio that allows targeting non-WM devices BUT note that this does not use the NETCF on the target - it is just a tool thing. The best development runtime/framework of course is the .NET Compact Framework (ok, so I may be slightly biased :-)). When I was at MEDC a South African guy (Dusan Babich) approached me with some brochures and interesting ideas about porting the NETCF to a subset of Symbian devices. He didn't have a demo to show at the time but he said they were very close to releasing. I am not sure how far it got but this is their website should you wish to follow up. I also found this excellent paper on porting the NETCF to Symbian phones. Just to keep the balance, here is an article on porting Symbian apps to Windows Mobile SmartPhones. So there you have it. A slightly lengthier reply than what I had in mind originally but it is good to have context, right? To wrap it up, my advice is to target the Windows Mobile platform that gives you a versatile range of devices with a common API (and the story will get even better with future versions of SmartPhone and PPC form factors converging, I would imagine). If I am perfectly honest, I am not sure WM will win the consumer market tomorrow, but it is definitely slashing into the enterprise space right now and once it is done there, more of an end user focus should follow, in my opinion. There was a pleasant surprise on Windows Update this morning, a Beta update of the Windows Mobile Device Center that I talked about last month. After downloading it I captured some screenshots below (some are behind the hyperlinks and others inline with the body). First connect a WM device or you'll get different screenshots since the UI options are visible only when applicable. Hovering over any of the 4 areas, exposes further options: Programs and Services, Pictures Music and Video, File Management and Mobile Device Settings. The File Management option doesn't seem to have changed from the one I captured last time. While aesthetics is one of the goals that the glass effect scores, it achieves a usability goal that, admittedly, you only appreciate after living with Vista for a while: it makes you naturally focus on the content of the window, the main area, rather than anything else; it draws your attention to the solid, useful bit in the middle of the window. Note that in all the previous applications/windows, you can move the window not only by holding down and moving the mouse on the title bar but also in any glass area. I don't know if this is a guideline but it should be (if it is, Windows Photo Gallery doesn't follow it). A few applications offer the ability to move a window by clicking on areas other than the title bar and it would be good to standardise on that area being glass. It would work the other way too by implicitly letting people know that "any glass area of a window can be used to drag the window". So what is all this information doing on a developer blog? It simply provides background for when I show you how to use glass in your managed applications, next. Ever since the announcement about the renaming of WinFX to .NET Framework v3.0 there have been many blog entries on the topic. Some we can ignore as they are of the "me too" variety e.g. "Here is the announcement. End of Message" or "This is good. End of Message" or "This is bad. End of Message". There have also been some posts about how "This is good. And the reason is X". Where X is usually something sales/marketing orientated; since we are developers, let's ignore those too. 2. It is not named ".NET 3.0". It is named ".NET Framework v3.0". This is more important than what you might think. a) .NET Framework v3.0 doesn't *change* any of that. 4. After .NET Framework v3.0 is released (with Windows Vista as has always been the plan) when you try to install it on XP SP2 it will bring all the v2.0 bits with it. If you have those bits on the machine already, it will simply add the 4 that you are missing. If you grasp all of the above facts but still want to have discussions about the choice of name then I don’t see the point. Microsoft's marketing department has never picked the right name (as far as developers are concerned) for any of the released technologies. If we look at this, then it either means that developers are never happy _or_ it means that Microsoft marketing will never get the names right so, again, why bother? Just focus on the technology! 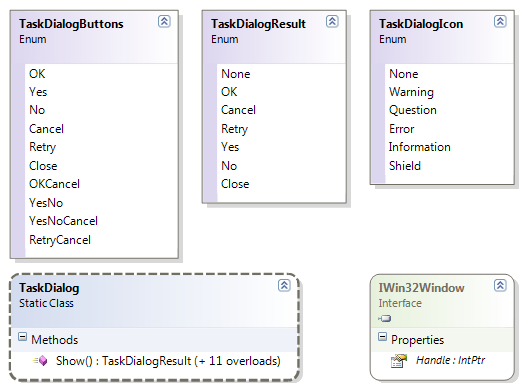 You know about my simple managed wrapper of the simple version of the new TaskDialog API. I was going to go ahead and implement a wrapper for the advanced version (namely TaskDialogIndirect) but it seems that VistaBridge does that already). You are a managed developer, with Vista Beta 2 and you also have the SDK (which you know from my Vista Links). Unszip [your drive letter]:\Program Files\Microsoft SDKs\Windows\v1.0\samples\CrossTechnologySamples.zip and browse to the VistaBridge folder and open the solution. If you have two projects in the solution then great, one of them is the Windows Presentation Foundation demo app. If one of the projects failed to load for you then you don't have the WPF Beta 2 bits installed. Not to worry though as the project that did load is the managed class library that you are interested in and it seems ok without the WPF bits. It wraps a few cool native APIs! I just discovered "prompt" for textboxes (no medal required, thank you :-)). The inspiration to dig into it was the mention in the Vista guidelines (scroll down to "Prompts"). So, you have empty textboxes and you need to prompt the user to do something and in some cases it makes sense to provide that prompt in the textbox while not making it part of the textbox text/content itself; when the user clicks on the textbox (gives it focus) or enters text into it, the prompt has to dissappear of course. "some prompt. click in the textbox to make me go away"
The good news seems to be that this is also available on XP, if we are to believe this msdn link. It would be nice to have this feature on Windows CE so we could use it in our Windows Mobile applications where screen real estate is at a premium and having additional labels to describe the textbox is sometimes wasteful. One of the many new things in 'comctl32.dll version 6' is the TaskDialog. A task dialog is similar to, while much more flexible than, a basic message box. When I say "look", what I mean is I will share my managed wrapper since TaskDialog is a native API only at this point. You may download the sample project here (remember, this only works on Vista! ).